Listening to the radio can be enlightening sometimes…like, say when you hear that 9% of your local school district is out with the flu. Cold and flu season is descending upon us like one of the Khaleesi’s dragons (yes, that was a Games of Thrones reference, we miss it so! ), vicious and unrelenting! Other than hiding in a bomb shelter or wearing a head to toe hazmat suit, what are some more social ways you can keep healthy? One way is adding probiotics into your diet. In our super bug society, good little bacteria flora often get killed off with the use of antibiotic soaps and drugs. These good flora may help ease digestion processes (reduce bloating, gas, etc or make you more regular) and improve the immune system (read more on factors that influence the micro flora balance here). Bacterial flora are often chilling out in yogurt but not everyone is able to digest dairy products. GoodBelly, a probiotic juice drink, offers a dairy free, soy free, non GMO, organic AND vegan alternative probiotic boost* for people looking to win the fight on germs. Each quart or shot also serves up immune enhancing vitamins and others, such as the PlusShot, include calcium too! 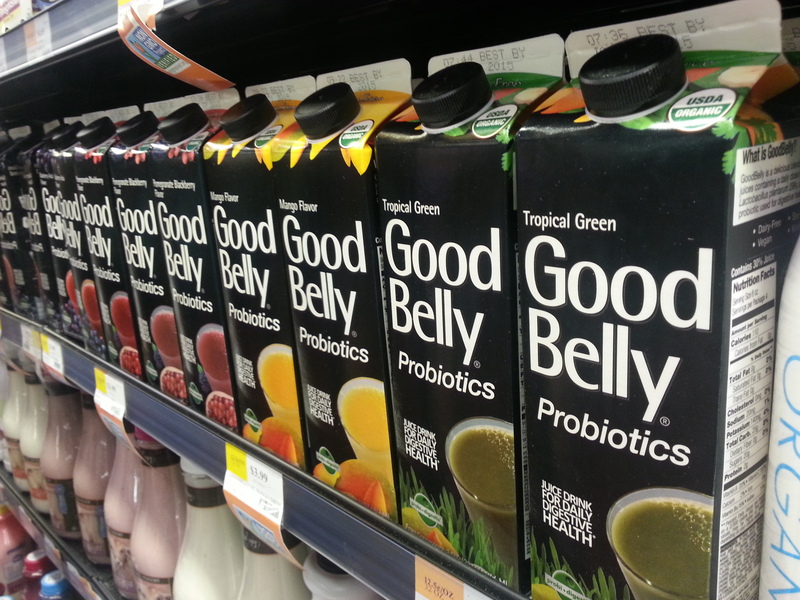 GoodBelly probiotic drinks contain live and active cultures of the probiotic strain, Lactobacillus plantarum 299v (LP299V®). This thoroughly researched strain, with over 125 species of flora, has demonstrated an efficient ability to make it’s way through the digestive track and improve both digestion and immunity. Many product options are juicy and fruit filled while some are for the purist who just wants a “straight shot” without the sugar. Those with digestive issues should try the SuperShot which contains 50 billion cultures (flora everywhurr!). We tried 1 flavor of the 32 ounce GoodBelly quart, Pomegranate Blackberry, and one flavor of the 2.7 ounce shots, Blueberry Acai. So how’d we fare? Well the Pomegranate Blackberry is seriously tasty and we liked it so much, we got another quart and snagged a Mango too. The shots were definitely more concentrated and we felt you could taste the oat base a little more in this version. Stomach wise, Kate already took probiotics pills and enjoyed the benefits of better digestion processes. GoodBelly is a tastier alternative to pills and is easy to incorporate as a breakfast juice or just a meal in general when running late for work. Ready to give it a shot (ha)? GoodBelly walks you through with a 12 Day Belly Reboot with buy 2 get 1 free coupons and a money back guarantee. Each day, you drink 8 ounces of GoodBelly and you can measure how you feel online with the Belly Tracker to see your results. 3 quarts should get you through your 12 day trial. 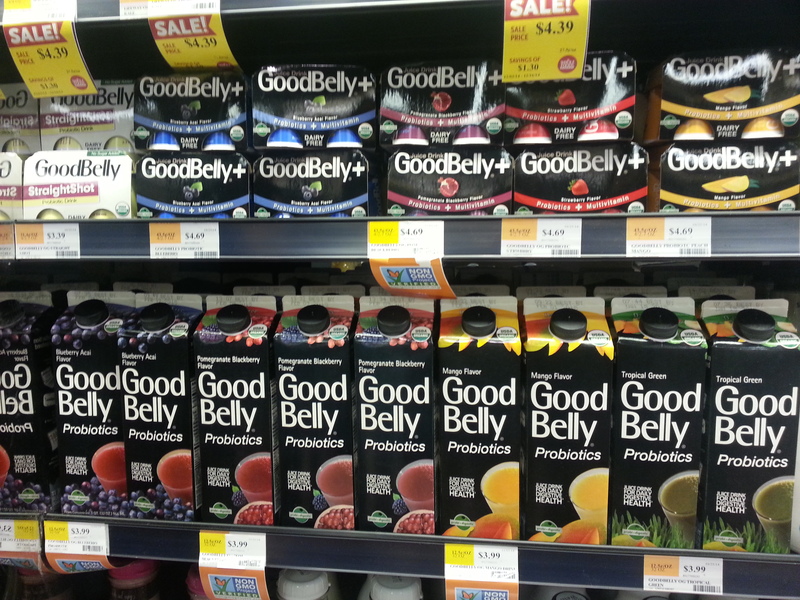 We found GoodBelly at the South Loop Mariano’s and it’s available at all Whole Foods. You can also use GoodBelly’s “Find a Store” function for a store near you! *Gluten sensitive folks, take note, although gluten free GoodBelly is available, we have had a hard time finding the elusive green capped bottles in the Chicago area. We did not receive compensation for this post but did receive coupons for free products.